Hey everyone, with Group Finder arriving in 1.3 to reward Black Hole comms for running Hardmode FPs and storymode tier 1 operations, obtaining black hole comms is quickly becoming a hotly debated topic, I have drawn up a little chart to show you exactly how much Black Hole Comms you can get per week when patch 1.3 arrives and how long you can expect the gearing up process to be. 1.3 world boss weekly ? How much does a full set of Black Hole Cost? Pugging via Group finder: 495/59 = 8.4 weeks ~ 2 months. Reality: Black Hole Belts/Bracers/Implants/Ear may not necessarily better than Rakata ones. This would shave off 170 Black Hole Comms (325 Black Hole comms is the new total), allowing you to get full set in 2.5 weeks, 3.3 weeks, and 5.5 weeks respectively. Do you have another character that is also level 50 and can run HM FPs & operations? 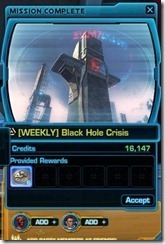 If so, you can earn Black Hole Comms on that character, buy Black Hole pieces for the character you want to gear up, and then rip out the mods to put in legacy gear appropriate for the character you want to gear up. Mail it over, remove the mods, put on whatever Columi/Rakata shells you have to maintain the set bonus. Lets do an example. Say I want to gear up my commando alt with my sorcerer main. I can earn Black Hole Comms on both characters. On my sorcerer, once I have enough Black Hole comms to buy a piece, I can go to the fleet vendor and purchase a commando Black Hole piece (i.e. chest). Next, I head over to Coruscant on my commando to purchase the trooper legacy gear appropriate for the slot (remember, armoring are bound to the slot, so you will need to purchase the corresponding slot in the legacy gear for the armoring to transfer over). In this case I would be purchasing the Trooper Renowned Chestpiece. Once I have the Trooper Renowned Chestpiece, I would mail it over to my sorcerer main who then rip off the mods from the Black Hole chest and put it on the Legacy chest. Finally, I would mail the Legacy chest back to my commando alt. If I don’t need the set bonus, I can save some credits by just wearing that legacy piece. 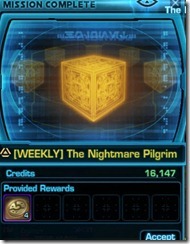 Otherwise, I will need to remove the mods again and put them on a Tionese/Columi/Rakata shell to retain the set bonus. HM FPs & SM EV/KP: You get 5 Black Hole comms daily as group finder rewards for letting it choosing a random Tier 1 or Tier 2 Harmode Flashpoint for you (Note that Tier 1 and Tier 2 HM FPs share rewards, meaning that completing one will lock it out for the other). That is 5x 7 days = 35. You also get 5 Black Hole Comms when you use the group finder to randomly select either storymode Eternity Vault or Karagga’s Palace. Since each operation have a week long lockout, you can get 2x 5 = 10 per week. 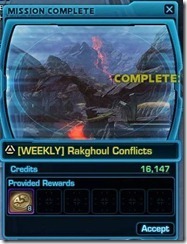 Rakghoul Weekly: Running both HM Lost Island and HM Kaon Under Siege. 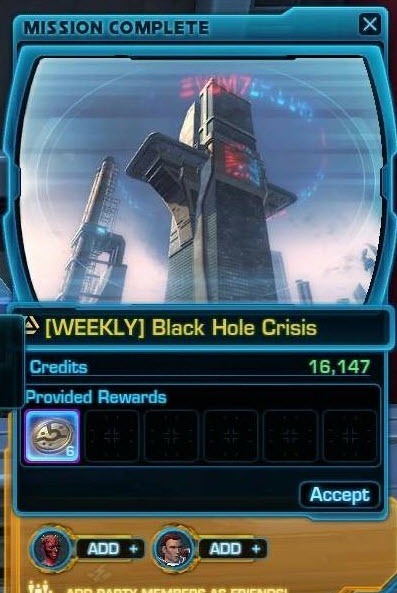 Black Hole weekly: Doing all the Black Hole dailies once. Storymode Explosive Conflict: 2 Black Hole comms per boss, 4 Black Hole Comms per chest. There are 4 bosses and 3 chests in total, giving you 4×2 + 3×4 = 20 Black Hole Comms. Explosive Conflict weekly: Defeat Colonel Vorgath in any difficulty. Nightmare Karagga’s Palace: 2 Black Hole Comms per boss for first 3 bosses, 3 Black Hole comms per boss for last 2 bosses (the Black Hole comms are located in a chest after you defeat the boss). That is 2×3 + 3×2 = 12. Hardmode Explosive Conflict: 4 Black Hole comms per boss, 4 Black Hole Comms per chest. There are 4 bosses and 3 chests in total, giving you 4×4 + 3×4 = 28 Black Hole Comms. 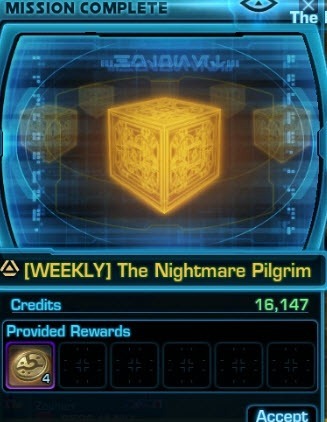 Nightmare Pilgrim: 4 Black Hole Comms per week. Indeed. Didn’t know about it either. I presume this also works with rakata / columi mods? yes works with all bound mods. Even like… normal crafted mods? mods are just mods, there is no difference between the rakata/columi or crafted ones. You should be able to stuff it into the legacy gear. Bound mods are mods you have used before and therefore bound to your character. They can be still inserted into legacy gear. I must be missing something… I have a “Consular’s Renowned Sash” which I purchased on my Level 14 Consular. I mail it to my level 50 Bounty Hunter. My level 50 Bounty Hunter then takes a level 25 mod and puts it into the belt. The requirement on the belt immediately becomes level 25 and then I can’t use it when I mail it back to my level 14 Consular. I am using mods that were previously bound to my BH… Did I miss a step or bork something up??? Nope, the mod you put in determines the level you can wear it. If you have two 50 characters, this would’t matter cuz both characters can wear everything. However, if you are xfering mods from high level chars to low level chars, you have to make sure that the mods you put in are within the lower char’s range. Can you put pvp rips into Columi gear, and keep the pvp bonuses? or does the Shell represent the bonus kept? example.. i absolutely hate the pvp knight gear.. ( not sure who consulted with Corky to design the pvp gear, but they should be stripped of all computer priveledges… ) i want to wear the Columi shell, but have it with pvp bonuses from my war hero sets.. is this possible? yes, your pvp bonus (from war hero armoring) will override the columi shell here. LOL, no I guess not. I tried with “regular” mods and… no go. What mods qualify as “bound mods”??? Bioware really screwed the pooch on this. Black hole is equal to the top end raiding gear minus the (worthless for most classes) set bonus. The “sky is falling and raiding is worthless threads” on the Offal Torums have their place on this design choice. What they SHOULD have done is always have the dailies/blackhole comms buy 1 generation of gear previous, ie comms that purchase Rakata at the time of this writing. I am no longer a special snowflake as of tomorrow. Not true, for dps at least, Campaign gear provides better armorings than black hole on at least some pieces, and the un-slotted armorings are not available via comms. Campaign also provides WORSE armorings than BH on some pieces, e.g. sorc gloves. Customised BH in set-bonus shells is the optimal setup, with maybe one or two Campaign armorings in the cases where the BH ones have the primary stat and endurance backwards. Well then you are in luck. You can only buy MK1 with BH comms. MK2 and further and Campaigngear must be obtained via raiding. In essence its 4 generations of gear previously (or isnt there Blackhole gear MK4?). Its true that you can get bh comms much quicker now. This is a good thing for a lot of people. I’m in a guild struggling to get past Toth and Zorn in SM. Now it will be a liitle easier for us. There would be four generations of gear if the different MK ranks actually meant anything they are all the same sat weights just different tables ie one helm may have defense/absorb while MK2 would be defense/accuracy. In short they are all the same tier just different stats. This is wrong. MK1/2/3, arent different tiers (or generations like you called them). They are instead different itemizations of the same tier (tier 2), without the set bonuses. 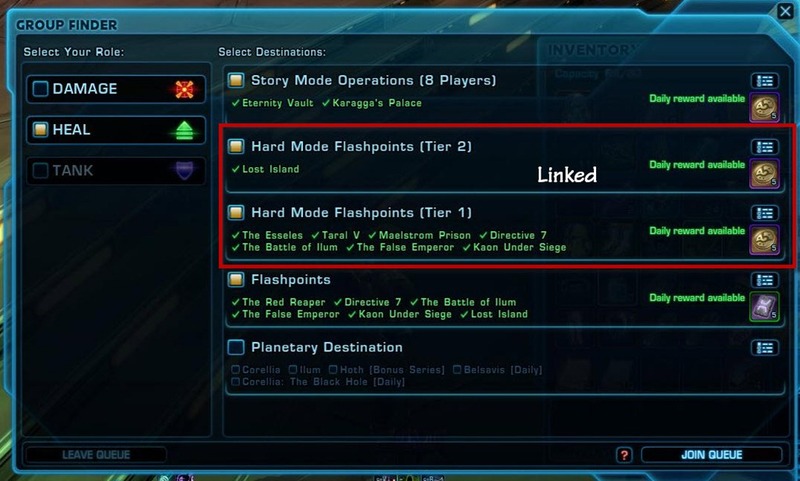 What Jedi Diomed said is true, you can essentially get Tier 2, from running dailies and Storymode ops. 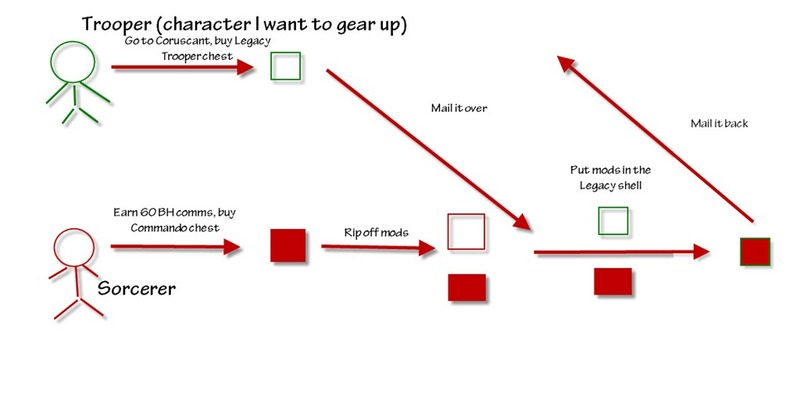 Wouldn’t be surprised if BW hotfixes the legacy gear/mail loophole. I’m just curious if it is working as intended to strip War Hero/Battle Master mods and send them over cross-faction through legacy items. It sounds like BW may of overlooked this, but then again, what is the whole point of legacy items if you don’t have to option to do such. Note: As a person who recently defected to the Empire, I hope this is working as intended. I had planned on sending my Full War Hero set via Legacy items to my Juggernaut from my Guardian. this is not new, it has being brought up before over and over on the official forums. Enough times that BW would have noticed it. 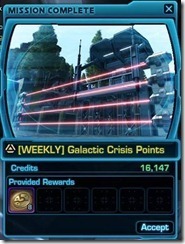 This method is very costly on credits so maybe that is why it is allowed. Thanks for the reply. I really hope it is allowed and not some hole. I have done some math with regards to the credits, and surprisingly, it is not so bad. Full War Hero mods cost 44000 to extract prior to 1.3. Now with the new 30% reduction, you’re looking at 660000 – 198000 (30% reduction) = 462000 credits to fully extract mods. Now you just add in the costs for Legacy Equipment which is roughly about 500-700 for the lowest tier, or a select few of the exalted pieces. 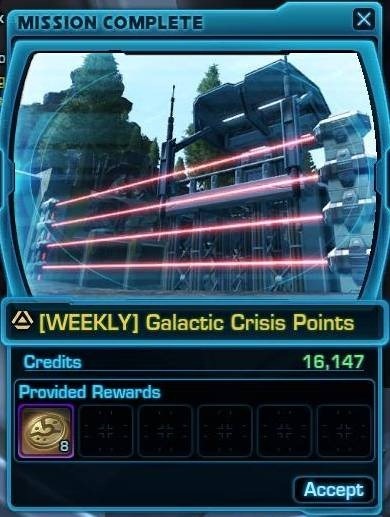 It should be just under 1.5 million credits which is totally doable. P.S Keep up to good work! Love the site. I’d generally fit in that “mid raid” category EXCEPT that I still haven’t managed to get past that first blasted robot boss in Hard Mode Lost Island… and I don’t think that anyone doing just PUG’ing via the Group Finder is going to get through that in a hurry either. Well, actually I did get it done through PUG, but it required a group that had 2 ranged DPS in it, and 4-5 wipes. what does “PUG” stand for ? Why did people put a “down” here? SICK means good. Just to get this straight, no BH comms can be obtained on any non-group finder OPS runs, such as premade guild ops runs to SM or HM KP and EV? This means if my guild is running SM OPS then its better for us to do it in random groups then together? that is correct. However you can queue up a premade operation with the group finder. Just have to let the group finder decide if you will be doing KP or EV. I don’t believe it applies to HM. Just SM. When my raid group has queued, even with the difficulty set to HM (or NM), it’s put us into SM. But to add a supplemental question to this, do the 10 comms come from one run or do you run both SM KP and SM EV in the same week for 5 BH comms each? A small question about using Legacy gear to carry the mods… isn’t the set bonus on the armoring? That means I can only put the Black Hole mod + enhancement on my Rakata? Or I’m missing something? The set bonus is only on the armoring for Campaign (and the equivalent PVP set). Rakata and lower have it on the shell, so you can put in a different armoring piece and keep the set bonus. Aaah, now I get it. Thank you! newb question – is there no black hole main hand? nope, none as far as I know. Never seen one drop either in Explosive Conflict. ya except you don’t get the barrels/hilts though except via campaign stuff. I am tired of getting all those gears. No one wants to team with people with no or low gears. You don’t get good gear if you don’t do those HM FP. It is a vicious cycle. so i’ve modified a Healing Spreadsheet that i found somewhere “Arulan” i believe is the one who made it it’s still based on 1.2 patch but some of the gear i have quickly inserted is recent. not sure if i can share it on here but if any wants to have a look let me know. If anyone is familiar with Cheeky’s Hunter Spreadsheet it’s like that you select your gear on gear tab and all the relevant stats HPS/HPCT/HPF is on the 2nd sheet tab. i’ve only just started it and have only small selection of Ear’s so far no OH’s but that is all coming. just need a list of everything that people are using. Fantastic read as always, Dulfy. Thanks! You need to update your chart because Black Hole Dailies have been removed from Explosive Conflict StoryMode. Would it be possible to do a quick 1.4 update on this post taking into account the loss of chest comms in SM EC, bosses that no longer drop them, the added Weekly for TFB, etc…?